An automatic scan from System Care Antivirus is running on my computer! It displays warning message claiming that 38 infections have been found on my system. Is my computer really at dangerous situation? Do I have to purchase its whole version of this product to regain a secure computer environment? If not, then how to uninstall this tricky rogue program entirely from my computer? Any ideas will do me a great favor! 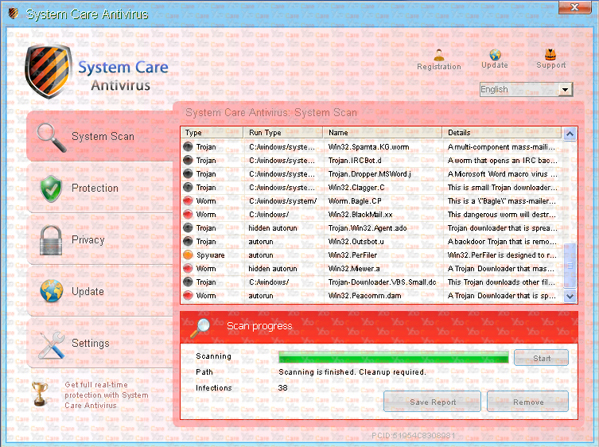 System Care Antivirus is identified as a horrible fake anti-spyware that has targeted many PC users from worldwide. This tricky fake program encounters unwary PC users accidentally when they gain access to malicious websites, junk emails or downloading harmful software from infected web pages carelessly. The interface of the rogue program is designed as licensed anti-virus software in an effort to cheat unknown PC users to trust this rogue scam infection and pay money to use its full editor. Another similar fake anti-spyware as AVASoft Professional Antivirus also damages the victimized computer terribly. Once this fake software targets your computer, it pretends to scan your whole system thoroughly and then displays some supposed reliable scan reports warning that 38 infections are found on your computer including 2 malicious programs, 26 viruses, 2 adware and 6 spyware and so on. Also, it offers options for PC users to either “Remove all threats now” or “continue unprotected”, trying to make PC victims nervous and go forward to remove all threats now via this supposed trusting System Care Antivirus. This rogue program distributes pop-up scan reports stating that many malicious infections have been found on your computer, and these infections have been clarified in details including Trojan and tracking cookies and so on. These scan results just seems real as licensed anti-virus software scan reports, and by this way cyber scammers try to cheat unknown computer users into paying money for its full version to remove all supposed threats. Aggressive as this rogue program is, it may pop up warning what your access to those current sites are claimed to be dangerous even when PC users visit legitimate website. Actually, System Care Antivirus won’t help you regain a clean computer, as it is a horrific computer virus itself which damages the victimized computer terribly. Providing that you pay for its full editor and activate it to clean these non-existing threats, you will just suffer from money loss and get an entirely corrupted computer as a result. Furthermore, it allows cyber scammers to gain access to your computer without your permission remotely in purposes of compromising your security and performing illegal activities aggressively. To avoid any further damage, you’d better take action to remove the fake anti-spyware from your computer completely at a quick time. Dangerous as System Care Antivirus is, it does great harm to the targeted computer in every aspects. This fake program may affect your web browsing tasks to redirect your favorite websites to other unwanted content. Also, it may change your homepage and vital settings randomly and displays annoying pop-up ads on your screen which makes you very disgusted. The fake program can degrade your system performance and disconnect your Internet frequently. If you leave the rogue program in your system too long, you may come across unexpected damages such as system crash and computer freezing. Even your legitimate anti-virus software still fails to delete this nasty fake program entirely, because your security protection may be disabled by this harmful rogue program. In this case, manual removal is a better way to remove the fake software completely. 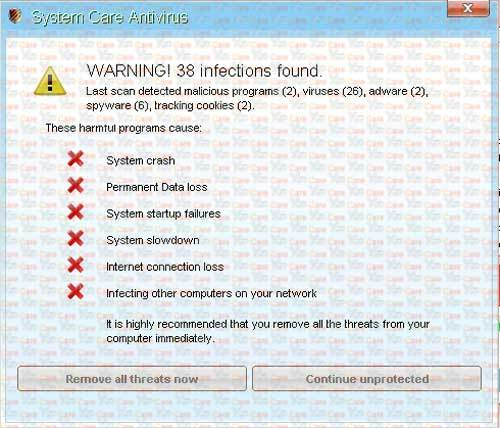 System Care Antivirus Warning image:38 infections found. Symptoms to Tell Your Computer has been Infected by the fake anti-spyware. Although this tricky virus can escape the scan of legitimate antivirus program, it also can be picked up by its symptoms. 1. Your computer will be much slower than before just like crawl which make you really upset. 2. Some malware you never saw before will be downloaded automatically after you turned on your computer. 3. You can find that your computer resources are highly consumed. 4. You will be kicked off the needed website quickly and then receive its pop up immediately. 5. Sometimes you may find that your keyboard likes dead because you can’t do anything on it. 6. In your system, you can receive some random files with a long name. However, these files not belong to you. Best way to Remove the stubborn rogue program virus Immediately. System Care Antivirus has threatened many computer users to trust that their computer situations are at great risk as many malicious items are detected from their systems. This fake program also tricks unknown computer users to purchase its registered version of product to clean the threatening infections which are actually non-existing. If you pay for its supposed full version of product, you will get nothing useful but a loss of money and a hazardous rogue program infection instead. This fake anti-spyware won’t help you clean these pop-up scan results or keep your computer safe from other threat attacks. In fact, it is designed by cyber criminals to violate victims’ privacy and compromise their security aggressively. Neither trust the rogue program nor keep it as a licensed security protection, or it will damage computer terribly to cause system crash and computer frozen. This fake anti-virus software is distributed by cyber scammers to target unwary users’ computer along with other malicious threats like spyware and malware. It can automatically install itself in your computer and pops up a scan on the screen, which performs the same way as licensed anti-virus software. Apart from cheating you into purchasing the rogue program, the fake anti-virus software may damage your system and normal programs terribly. Once corrupted, your system performs slowly and your executable programs function poorly, particularly the security protection. It can be blocked by this fake virus, and it loses its function to handle with the tricky rogue program successfully. It may take much time and money to fix your PC in Local PC stores or call PC technician at door. Thus, manual removal with PC professionals is considered to be the most effective way to remove the System Care Antivirus entirely. 2. Press Ctrl+Alt+Del keys together and stop System Care Antivirus virus processes in the Windows Task Manager. 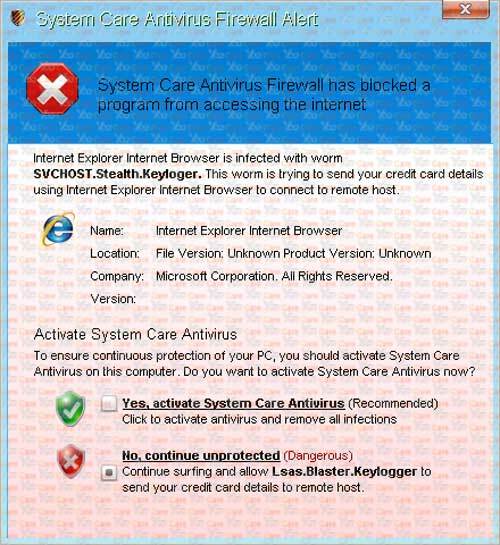 System Care Antivirus fake program is a great threat to computer users tricking unknown users to activate its registered version to clean their computers. Also, it launches and scans your computer every time the system starts. After scanning, it will display a fraudulent pop-up alert claiming that many dangerous infections are detected on your computer.It will deliberately display fake scan results or fake security warnings to convince you that your computer is infected with numerous viruses and the only effective way is to use their product. By doing so, you are asked to purchase the full version or registered version of System Care Antivirus. It is created to scare PC users. 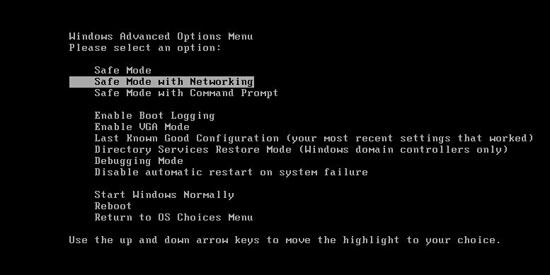 Usually, it will also disable network connection on the infected computer so that you cannot get online or doing many usual work on victim PC. It will show up lots of annoying alerts. Instead of trusting this malicious tool, you need to take necessary manual steps to delete it immediately. Manual removal is a complex and risky process, so please contact YooCare PC experts 24/7 online to help you remove the fake virus from your computer completely. Friendly Reminder:If you still find it difficult to follow the removal guide above smoothly, please contact YooCare: PC experts 24/7 online will offer you the most effective tech support to remove System Care Antivirus virus completely. I followed the steps to remove the fake antivirus, however my C drive is showing as being almost full (1.25gb free of 232gb). The computer is also very slow and crashes a lot. What have I done wrong in the removal process? Or could it be that there are files left on the computer from the virus? Are you able to help me with this? thanks mate. this system care antivirus really got me crazy!!! Thank you very much for instructions. I have successfully uninstall this nasty virus. Good luck !